The Acts of the Apostles forms an important bridge between the life and teachings of Jesus Christ and the writings and labors of His Apostles. The book of Acts provides us with our principal view of the Church of Jesus Christ during its formative years. In it we see the members and leaders of the infant Church working to overcome the problems encountered when the teachings of Jesus Christ came in conflict with Jewish traditions and Gentile influences. Unlike the four Gospels, which share a large amount of similar content, the book of Acts stands relatively alone; without it, the only information we would have about the early history of the Church would be the small amount provided by the New Testament epistles. In addition, Acts provides valuable historical context for the epistles of Paul. 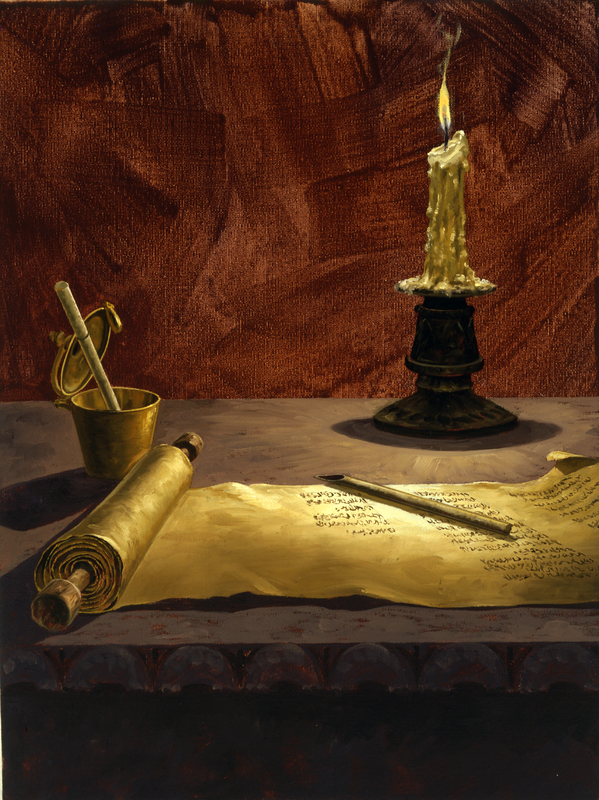 New Testament Era Scroll and Candle, by Lyle Beddes. In New Testament times, a typical papyrus scroll measured 32–35 feet (10–11 meters) in length and could contain the entire Greek text of a book the size of Luke or Acts. Internal and external evidence indicate that Luke is the author of the Acts of the Apostles and that he wrote Acts as a companion work, or sequel, to accompany his Gospel (see Luke 1:1–4; Acts 1:1; see also “Introduction to the Gospel According to St. Luke” in chapter 15). Several passages in Acts are written in first person (the so-called “we” passages in Acts 16:10–17; 20:5–15; 21:1–18; 27:1–28:16), suggesting that Luke was a participant in those parts of the narrative. Paul’s Epistle to the Colossians implies that Luke was a Gentile Christian, because in Colossians 4:7–11, Paul lists greetings from those “of the circumcision” (Jewish Christians), then lists greetings from others, including Luke (see Colossians 4:12–14). Luke was a physician by profession (see Colossians 4:14). When and where was Acts written? Acts was written after the Gospel According to St. Luke (see Acts 1:1), which scholars estimate was written between A.D. 60 and A.D. 85. The place of writing cannot be determined with assurance. To whom was Acts written and why? Luke addressed the book of Acts and his Gospel to a man named Theophilus (see Acts 1:1; Luke 1:1–4; “Introduction to the Gospel According to St. Luke” in chapter 15). We do not know who Theophilus was or what positions or honors he held, though he appears to have been a Christian. Though Luke addressed his writings to a single individual, anyone who reads his writings will find greater understanding of the gospel of Jesus Christ and the early Church. What are some distinctive features of Acts? The events described in Acts occurred over a period of about 30 years (about A.D. 30–62) and focus mainly on the ministries of Peter and Paul. Luke gathered the information he could on the growth of the Church in Jerusalem and Samaria, which he had not witnessed personally. Therefore, he gave only limited attention to leaders such as Peter, Stephen, and Philip. Luke was able to write extensively about Paul because he had served as a missionary companion to Paul and had witnessed many of the events described and had learned Paul’s part of the story through personal acquaintance. These facts help explain why Acts presents a history of the early Church that emphasizes some people and events more than others. The book of Acts is a work of inspired, sacred history, mentioning more than 30 countries and 50 cities, telling the story of the rise and spread of Christianity, beginning in the provincial Jewish capital of Jerusalem and ending in Rome, the great capital of the empire. A principal theme of the book of Acts is the growth of the Church through the preaching of God’s word. As recorded in Acts 1:8, the resurrected Savior foretold the progress of apostolic missionary work, and the narrative structure of Acts follows the same progression. The work commenced in Jerusalem (see Acts 1–7), then expanded to Judea and Samaria (see Acts 8–9), and ultimately went “unto the uttermost part of the earth” (see Acts 10–28). Critical to the growth of the early Church were the conversion of Paul (Acts 9) and his subsequent missions; the vision of Peter regarding the acceptance of Gentiles into the Church without prior conversion to Judaism (Acts 10:9–16, 34–35); the conversion of Cornelius, a Gentile (Acts 10:1–8, 19–48); and the doctrines taught at the Jerusalem conference (Acts 15). As recorded in Luke 24:49, the Savior instructed the Apostles that they were to begin their ministry only after they had been “endued with power from on high.” Acts records the endowment of this power by the Holy Ghost and describes its dramatic results, beginning with the conversion of thousands on the day of Pentecost (see Acts 2). Throughout Acts, Luke emphasized the workings of the Holy Ghost on individuals and congregations, particularly in the ministry of Paul (see Acts 6:3, 5; 9:17; 11:15, 24; 13:2, 4, 9, 52). In Acts, the Church is sometimes referred to as the “way” (see Acts 9:1–2; 19:9, 23; 22:4; 24:14, 22). About 30 percent of Acts covers the time Paul was in custody as a prisoner (see Acts 16:22–40; 21:27–28:3). For 40 days following His Resurrection, Jesus Christ ministered to His disciples. He ascended into heaven, promising to return in the latter days in like manner. By inspiration, the Apostles called Matthias to fill the vacancy in the Quorum of the Twelve Apostles. The Holy Ghost was poured out on the day of Pentecost. Six weeks following the Crucifixion, Peter boldly testified in Jerusalem of the resurrected Savior. About three thousand souls were converted. At the temple Peter and John healed a man lame from birth and taught about the mission of Jesus Christ. They were arrested and taken before the Jewish council. Church members had the spirit of unity and had all things in common. Peter and John were again arrested, and an angel delivered them from prison. The Apostles called seven men to assist them in their ministry; one of these men, Stephen, testified before the Jewish council, and the council members put him to death. Philip preached the gospel throughout Samaria. The Lord appeared to Saul on the road to Damascus. Saul was baptized and began his ministry. The Lord used a vision to instruct Peter that Gentiles were to be accepted into the Church without prejudice. Peter taught Cornelius and oversaw the baptism of many Gentiles. Herod Agrippa I had the Apostle James put to death, and he imprisoned Peter. Saul and Barnabas were called to missionary service. They traveled to Cyprus and throughout Asia Minor, encountering opposition from Jews and some acceptance from Gentiles. They established “churches” (congregations), ordained elders, and returned to Antioch in Syria. Church leaders met in Jerusalem and determined that Gentile converts did not need to be circumcised when they joined the Church. Paul (as Saul was now called) and Silas departed on the mission that would become Paul’s second missionary journey. Paul and Silas visited churches established earlier in Asia Minor and traveled further through Macedonia and Achaia (a region of Greece). On Mars Hill in Athens, Paul preached of “the unknown God” and declared, “We are the offspring of God” (Acts 17:23, 29). Paul concluded his second mission, visiting Ephesus and Jerusalem before returning to Antioch in Syria. Paul departed on a third mission, visiting and strengthening disciples throughout Asia Minor. God worked miracles through Paul in Ephesus. After traveling through Macedonia and Greece, Paul determined to return to Jerusalem. He prophesied of coming apostasy. In Jerusalem, Paul was arrested and continued to testify of Jesus Christ. The Lord again appeared to Paul. Many Jews plotted to kill Paul. In Caesarea, he testified before Felix, Festus, and Agrippa. Paul was shipwrecked on his way to Rome. Paul preached the gospel while under house arrest in Rome. For a period of 40 days, the resurrected Savior visited His disciples and spoke to them “of the things pertaining to the kingdom of God” (Acts 1:3). Though Acts presents little detail of those days, it appears that during that time Church leaders received instruction on how to lead the Church in the Lord’s absence. Near the completion of those 40 days, Jesus Christ commissioned His Apostles to “be witnesses unto me … and unto the uttermost part of the earth” and was then “taken up” into heaven (Acts 1:8–9). Ultimately, the lives of many thousands were transformed by the ministries of these apostolic witnesses of Jesus Christ. The events recorded in Acts 1–2 begin to show how the resurrected Jesus Christ led the Church through the ministration of the Holy Ghost. After seeking the Lord’s direction, Peter presided over the selection of a new Apostle. The Spirit was poured out upon the Apostles on the day of Pentecost. On that day about three thousand souls “were pricked in their heart” (Acts 2:37) by the Holy Ghost and, as instructed by Peter, repented and were baptized. The young Church was flourishing. “‘Until the day in which he was taken up, after that he through the Holy Ghost had given commandments unto the apostles whom he had chosen’ (Acts 1:1–2; italics added). “The direction of the Church is the same. The location of the Savior has been altered, but the direction and leadership of the Church is exactly the same. Then, having made that point, as if to prove in this most remarkable string of spiritual experiences all the way through the book, we get manifestations of the Lord’s power through the Holy Ghost at every turn. … The first teaching in the book of Acts from the resurrected Christ to the Twelve is that they ‘shall be baptized with the Holy Ghost not many days hence’ (Acts 1:5), and that ‘ye shall receive power, after that the Holy Ghost is come upon you’ (v. 8; italics added). “After [Jesus] ascends to heaven before their very eyes, Peter gets the Church together﻿—all one hundred and twenty of them. Can you see what an impact the troubles and the Crucifixion and the opposition had had on them? One hundred and twenty people gather and Peter says, ‘Men and brethren, this scripture must needs have been fulfilled, which the Holy Ghost by the mouth of David spake before concerning Judas’ (v. 16; italics added). In filling Judas’s vacancy in the Twelve, they prayed exactly the way the Quorum of the Twelve and First Presidency pray today: ‘Thou, Lord, which knowest the hearts of all men, shew whether of these … thou hast chosen’ (v. 24; italics added). … And Matthias was called. “But that first chapter of turning heavenward, so clearly marking the divine guidance that would continue to direct the Church, is only a warm-up to chapter 2” (“Therefore, What?” [Church Educational System conference on the New Testament, Aug. 8, 2000], 6). The word “passion” refers to the Savior’s intense suffering during the events of the Atonement, particularly His suffering in Gethsemane and on the cross. The Greek term translated as “infallible proofs” suggests a token or proof that causes something to be known with certainty. During the 40 days when the resurrected Savior taught His disciples (see Acts 1:3), those who saw and spoke with Him witnessed “infallible proofs,” which included the wounds in His resurrected hands, wrists, and feet. Third Nephi shows a pattern for what the Savior may have done during His 40-day ministry in the Old World (see 3 Nephi 11–26). During His post-Resurrection visit to the Nephites, He showed His disciples the tokens of His Atonement (as He did in Jerusalem), taught the importance of His doctrine, discussed the essential nature of ordinances and how they were to be performed, outlined the authority of His chosen Twelve, taught unspeakable truths of eternity, and blessed His followers. “Before [Jesus] ascended, He said, ‘Behold, I send the promise of my Father upon you: but tarry ye in the city of Jerusalem, until ye be [endowed] with power from on high’ [Luke 24:49]. “‘And there appeared unto them cloven tongues like as of fire, and it sat upon each of them. “‘And they were all filled with the Holy Ghost’ [Acts 2:2–4]. “With that the Twelve were fully empowered” (“The Cloven Tongues of Fire,” Ensign, May 2000, 7). See also John 14:16–17, 26, when the Savior promised the Apostles that after His departure they would receive the Holy Ghost. The Apostles had seen and heard many things during the 40 days the resurrected Savior had spent with them. As He prepared to ascend into heaven, they asked Him if He would soon reestablish the kind of messianic kingdom the Jews had long been expecting﻿—one like King David’s kingdom of old. This question set the stage for Jesus’s response﻿—the great commission to the Apostles found in Acts 1:8. “The gift of the Holy Ghost … quickens all the intellectual faculties, increases, enlarges, expands, and purifies all the natural passions and affections, and adapts them, by the gift of wisdom, to their lawful use. It inspires, develops, cultivates, and matures all the fine-toned sympathies, joys, tastes, kindred feelings, and affections of our nature. It inspires virtue, kindness, goodness, tenderness, gentleness, and charity” ( Key to the Science of Theology , 61). The Savior then declared that the disciples would be witnesses of Him throughout the world. His words recorded in Acts 1:8 aptly outline how the book of Acts proceeds. Acts 1–7 describes the Apostles’ labors in Jerusalem. Acts 8–9 recounts some of their labors in Judea and Samaria. Acts 10–28 tells how Apostles carried the gospel to the “uttermost parts of the earth.” Though these latter chapters focus mainly on the Apostle Paul, other sources preserve traditions about the missionary labors of other disciples. According to 1 Peter 5:13, Peter ministered in Rome (referred to as Babylon in this verse). According to traditions found in other sources, John ministered from Ephesus; Andrew preached the gospel in the region of modern-day Ukraine, Romania, and Russia; Matthew in Ethiopia; Philip in Syria, Turkey, and Greece; Bartholomew in India; Simon Zelotes in Britain and Persia; Thomas in India; and Mark in Rome and Egypt. The interior of the traditional site of the “upper room” (Acts 1:13) in Jerusalem where the Apostles and early members of the Church met to pray after the Savior’s Ascension and where the Spirit was poured out on the day of Pentecost. Though this room was built in A.D. 1335, it is located on the site of earlier structures that date to Roman times. When the Savior’s time with His disciples was complete, He ascended into heaven, and His disciples witnessed this miraculous event. In accordance with the law of witnesses (see Deuteronomy 17:6; 2 Corinthians 13:1), two angels told them that Jesus Christ would return to the earth in “like manner” as He had ascended. This announcement makes clear to all mankind what they are to watch for in connection with the Savior’s Second Coming and protects them against deception. Elder Jeffrey R. Holland observed that Joseph Smith’s First Vision was one fulfillment of that promise: “[Jesus Christ] and His Father, the God and Father of us all, appeared to the boy prophet Joseph Smith in fulfillment of that ancient promise that the resurrected Jesus of Nazareth would again restore His Church on earth and again ‘come in like manner as [those Judean Saints had] seen him [ascend] into heaven’ [Acts 1:11]” (“Prophets in the Land Again,” Ensign or Liahona, Nov. 2006, 106). Another fulfillment of this prophecy will occur at the Second Coming when the Savior descends and actually stands on the Mount of Olives, from whence He ascended (see Zechariah 14:4; D&C 45:47–53). Acts 1:12. How Far Is a Sabbath Day’s Journey? According to Jewish oral traditions, a Sabbath day’s journey was the distance a Jew was permitted to walk on the Sabbath. Later rabbinic sources give this as 2,000 cubits﻿—a distance of about 3,600 feet (about 1,100 meters). “… I was invited to kneel at bedtime with a family when I was a guest in their home. The smallest child was asked to be voice. He prayed like a patriarch for every person in the family, by name. I opened my eyes for an instant to see the faces of the other children and the parents. I could tell that they were joining their faith and their hearts in that little boy’s prayer. “Some Relief Society sisters recently prayed together as they prepared to visit for the first time a young widow whose husband died suddenly. They wanted to know what to do and how to work together to help prepare the home for family and friends who would come at the time of the funeral. They needed to know what words of comfort they could speak for the Lord. An answer to their prayer came. When they arrived at the house, each sister moved to complete a task. The house was ready so quickly that some sisters regretted not being able to do more. Words of comfort were spoken which fit perfectly together. They had given the Lord’s service as one, hearts knit together” (“Our Hearts Knit as One,” Ensign or Liahona, Nov. 2008, 68–69). The “brethren” of Jesus Christ mentioned in Acts 1:14 were the sons of Mary and Joseph, Jesus Christ’s half-brothers (see Matthew 13:55; Mark 6:3). Though Jesus’s brothers had not always believed in His divinity (see John 7:5), they were now counted among the believers. Jesus’s brother James would later become a leader of the Church in Jerusalem (see Acts 12:17; 15:13) and an Apostle (see Galatians 1:19). His brother “Juda” (Mark 6:3) is likely the author of the Epistle of Jude. Acts 1:18–19 refers to the account found in Matthew 27:3–10. Following the suicide of Judas Iscariot (“this man”), the chief priests took the 30 pieces of silver that Judas had cast down in the temple (“the reward of iniquity”) and purchased “the potter’s field,” wherein strangers were later buried. What was the process the Apostles followed to select a new Apostle? What qualifications did the new Apostle need to have? What impresses you about the Apostles’ prayer recorded in verse 24? Acts 1:21–26. How Are Apostles Called in Our Day? Anciently, casting lots was a means of making a decision (see Acts 1:26). Among the Jews it was generally believed that the hand of God would direct the outcome (see Proverbs 16:33). Though the exact method of casting lots in this instance is not known, one ancient method involved each voter writing a name on a broken piece of pottery and then putting it forth to be read or counted. When choosing a replacement for Judas Iscariot in the Quorum of the Twelve Apostles, the remaining Apostles understood the importance of the man being a witness, with the others, of Jesus’s ministry, from His baptism through His Resurrection (see Acts 1:22). The importance of this eyewitness testimony is a major theme in the early Church and the early chapters of Acts (see Acts 2:32; 3:15; 4:20; 5:32). “Under the Lord’s plan, those who have responsibility to select officers are governed by one overriding question: ‘Whom would the Lord have?’ There is quiet and thoughtful deliberation. And there is much of prayer to receive the confirmation of the Holy Spirit that the choice is correct. “… In filling that vacancy, each member of the First Presidency and the Quorum of the Twelve was at liberty to make suggestions. I am confident that in every case, there was solemn and earnest prayer. A choice was then made by the First Presidency, again after solemn and serious prayer. This choice was sustained by the Council of the Twelve. Today, the membership of the Church in conference assembled has sustained that choice. “I give you my testimony … that the impression to call Brother Hales to this high and sacred office came by the Holy Spirit, by the spirit of prophecy and revelation. Brother Hales did not suggest his own name. His name was suggested by the Spirit” (“God Is at the Helm,” Ensign, May 1994, 53–54). “As part of the law of Moses, the feast of Pentecost or firstfruits was held fifty days after the feast of the Passover (Lev. 23:16). Pentecost was to celebrate the harvest, and in the Old Testament it is called the feast of harvest or the feast of weeks” (Guide to the Scriptures, “Pentecost”; scriptures.lds.org). It is therefore fitting that on this day, which celebrated the first fruits of the harvest, “about three thousand souls” were added to the Church (Acts 2:41). Pentecost was a pilgrimage festival, when all males of the covenant were to come before the Lord at Jerusalem, which is why so many people from various countries were crowded into Jerusalem (see Acts 2:9–10). On the day of Pentecost, the Twelve Apostles were all gathered in one place. Suddenly, the Spirit was poured out upon them. Filled with the Holy Ghost, these Brethren prophesied and spoke in tongues. Elder Jeffrey R. Holland discussed the outpouring of the Spirit on the day of Pentecost: “The very name Pentecost comes into the Christian vocabulary as synonymous with breathtaking spiritual manifestations and a divine outpouring of the Holy Ghost upon all the people. Revelation came from heaven with the sound ‘as of a rushing mighty wind, and it filled all the house’ (Acts 2:2), and it filled the brethren” (“Therefore, What?” 6). This great pentecostal experience, when the Holy Ghost was poured out upon a large gathering of people, has a parallel in Latter-day Saint history. At the time of the dedicatory services for the Kirtland Temple, the Prophet Joseph Smith (1805–44) prayed for a special outpouring of the Spirit from on high: “Let it be fulfilled upon them, as upon those on the day of Pentecost,” he pleaded in behalf of the Saints. “Let the gift of tongues be poured out upon thy people, even cloven tongues as of fire, and the interpretation thereof. And let thy house be filled, as with a rushing mighty wind, with thy glory” (D&C 109:36–37). This plea was fulfilled, not just once, but several times during the days following the initial dedicatory services. Joseph Smith recorded that on one occasion, “a noise was heard like the sound of a rushing mighty wind, which filled the [Kirtland] Temple, and all the congregation simultaneously arose, being moved upon by an invisible power; many began to speak in tongues and prophesy; others saw glorious visions; and I beheld the Temple was filled with angels, which fact I declared to the congregation” ( History of the Church, 2:428). Dramatic spiritual manifestations are often difficult to communicate in human language (see 3 Nephi 17:15–17; 19:31–34; JS—H 1:32) and can be understood only by the power of the Spirit (see 1 Corinthians 2:9–14). “Cloven tongues,” taken literally, refers to tongues that are cloven or forked, or that have the appearance of the flame of a fire. As the Holy Ghost was poured out on the disciples, the “cloven tongues like as of fire” (Acts 2:3) were a visible manifestation of the Spirit’s presence. John the Baptist had likened the reception of the Holy Ghost to a baptism of “fire” (Matthew 3:11; Luke 3:16). In ancient Israel, fire often symbolized the divine presence (see Exodus 3:2–5; 13:21; 24:17; Helaman 5:22–24, 43–45; 3 Nephi 19:13–14). For example, the “fire” of the Lord had rested upon the tabernacle in ancient Israel (see Exodus 40:38). The image of “cloven tongues,” used to describe the divine fire on the day of Pentecost, symbolized that the disciples had received the gift of the Holy Ghost, promised by the Savior, with the power to preach the word of God by the gift of tongues. The divine fire can be described as the “everlasting burnings of God; for God dwells in everlasting burnings” (Joseph Smith, in History of the Church, 6:317). On the day of Pentecost, the environment of heaven was brought to earth. How many different groups of peoples or nationalities can you identify in these verses? Why was it remarkable that all of these people heard the gospel in their own languages from the Galilean Apostles? When have you or someone you know experienced some manifestation of the gift of tongues? 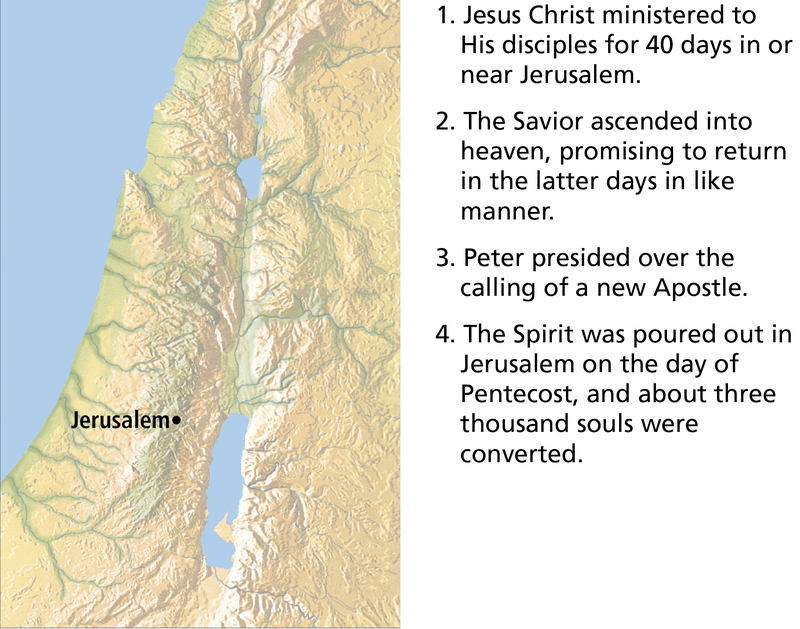 The places from which the people described in Acts 2:5–11 had journeyed to Jerusalem. The map also illustrates the paths by which the gospel spread as the visitors to Jerusalem returned to their homes. The crowd that was gathered in Jerusalem on the day of Pentecost was a diverse group of Jews who had been part of the Diaspora (the scattering of the house of Israel into lands other than Palestine) who spoke many different languages. Each man heard the Apostles’ words in his own language. The gift of tongues was given to the early Apostles on the day of Pentecost so they could preach the gospel in multiple languages. This gift is one of the signs of the true Church (see Articles of Faith 1:7). The Prophet Joseph Smith explained the proper use of this gift: “The gift of tongues by the power of the Holy Ghost in the Church, is for the benefit of the servants of God to preach to unbelievers, as on the day of Pentecost” ( Teachings of Presidents of the Church: Joseph Smith , 383). To read more about the gift of tongues, see the commentary for 1 Corinthians 14:2–22. President Joseph Fielding Smith (1876–1972) declared: “The true gift of tongues is made manifest in the Church more abundantly, perhaps, than any other spiritual gift. Every missionary who goes forth to teach the gospel in a foreign language, if he [or she] is prayerful and faithful, receives this gift” ( Answers to Gospel Questions, 5 vols. [1957–66], 2:29). After the great outpouring of the Spirit, Peter stood to teach the assembled crowd. Being full of the Holy Ghost, he explained the meaning of scriptures with clarity and insight. He taught that the gift of tongues and other manifestations of the Spirit among the Apostles were a fulfillment of the prophecy found in Joel 2:28–32 (see Acts 2:14–21). (It should be noted that this was not the only fulfillment of the prophecy found in Joel 2. Modern prophets have taught that the events of the Restoration of the gospel were additional fulfillments of this prophecy.) Peter boldly and courageously proclaimed to the Jews that Jesus of Nazareth, the Man they had seen perform miracles and whom they had delivered to be crucified, had been resurrected and had loosed the “pains of death” (see Acts 2:22–24). As Peter taught about Jesus Christ, he quoted Psalm 16:8–11 (see Acts 2:25–28) and Psalm 110:1 (see Acts 2:34–35), explaining that in these passages, King David had prophesied of the Resurrection of Christ. In Latter-day Saint history we see a similar example of the Holy Ghost enhancing a prophet’s scriptural understanding. The Prophet Joseph Smith recorded that the following occurred after he and Oliver Cowdery were baptized and had received the Holy Ghost: “We were filled with the Holy Ghost, and rejoiced in the God of our salvation. Our minds being now enlightened, we began to have the scriptures laid open to our understandings, and the true meaning and intention of their more mysterious passages revealed unto us in a manner which we never could attain to previously, nor ever before had thought of” (Joseph Smith—History 1:73–74). For more insight on Peter’s teaching from the scriptures of the Old Testament, see the commentary for Luke 24:27, 32. “Second, it is the permanent location of those who are not redeemed by the atonement of Jesus Christ. In this sense, hell is permanent. It is for those who are found ‘filthy still’ (D&C 88:35, 102). This is the place where Satan, his angels, and the sons of perdition﻿—those who have denied the Son after the Father has revealed him﻿—will dwell eternally (D&C 76:43–46)” (Guide to the Scriptures, “Hell”; scriptures.lds.org). Concerning King David’s eternal inheritance, Elder Bruce R. McConkie taught that David “received the promise that his soul would not be left in hell, that is, he would not be a son of perdition, he would not be cast out eternally with the devil and his angels. Rather, when death and hell deliver up the dead which are in them, he shall come forth from the grave and receive that inheritance which he merits. See Rev. 20:11–15” ( Doctrinal New Testament Commentary, 3 vols. [1965–73], 2:39). The crowd of people who heard Peter were “pricked in their heart” (Acts 2:37), meaning that Peter’s words had “pierced” them, bringing grief and remorse. As the people came to the terrible realization that they had crucified their Messiah, they may have feared that they had lost hope of salvation. Thus, they cried out to the Apostles in anguish, “Men and brethren, what shall we do?” Calling the Apostles their “brethren” implies that they were already persuaded in their hearts of their need to repent and have faith in the Savior. What actions in these verses demonstrate that those baptized on the day of Pentecost were truly converted? The crowd’s question, “What shall we do?” demonstrated that they were beginning to have faith in Jesus Christ. In answer to this question, Peter taught the people that they needed to repent, be baptized in the name of Jesus Christ for the remission of sins, and receive the gift of the Holy Ghost. The principles that were taught by Peter were declared by the Prophet Joseph Smith to be “the first principles and ordinances of the Gospel” (Articles of Faith 1:4; see also 3 Nephi 11:31–36; 27:13–21). Faith in Christ, repentance, baptism, receiving the Holy Ghost, and thereafter enduring in faith are essential to receiving the full blessings of the Atonement of Christ. “… No matter what trials await us, we can find the answer to that question, ‘What shall we do?’ [Acts 2:37]. We, and those we love, will be guided and corrected and protected, and we will be comforted. … I know the gift of the Holy Ghost, a sacred spiritual power, can be a constant companion to every soul who will receive it” (“The Cloven Tongues of Fire,” Ensign, May 2000, 9). Peter admonished the Jews to be saved from this “untoward generation,” meaning the “crooked” people around them who were rebelling against God (Acts 2:40, footnote b). This is an admonition that could apply in our day as well. About three thousand people who heard Peter’s message were converted and received the ordinance of baptism. New Testament Era Sacrament, by Lyle Beddes. One way Church members continue steadfast in the Church is by meeting regularly with the Saints and partaking of the sacrament (see Acts 2:42). Luke taught that the Saints in Jerusalem “continued steadfastly in the apostles’ doctrine and fellowship” (Acts 2:42). Doing this helped the early Saints to remain steadfast in the Church. The Savior taught this same principle to the Nephites and to all of us: “Blessed are ye if ye shall give heed unto the words of these twelve whom I have chosen from among you to minister unto you, and to be your servants” (3 Nephi 12:1). President M. Russell Ballard of the Quorum of the Twelve Apostles spoke of the importance of giving heed to the Apostles’ teachings: “Today I make you a promise. It’s a simple one, but it is true. If you will listen to the living prophet and the apostles and heed our counsel, you will not go astray” (“His Word Ye Shall Receive,” Ensign, May 2001, 66). The Jerusalem Saints also met together for “breaking of bread” and “prayers” (Acts 2:42), probably referring to shared meals that included the sacrament of the Lord’s Supper. In our day, we too remain steadfast in the Church by meeting regularly with the Saints and partaking of the sacrament. The word fear in Acts 2:43 means “reverence” or “awe.” The sense of the phrase “and fear came upon every soul” is that all the Saints were filled with reverence and awe. “Third, we must lay on the altar and sacrifice whatever is required by the Lord. We begin by offering a ‘broken heart and a contrite spirit.’ We follow this by giving our best effort in our assigned fields of labor and callings. We learn our duty and execute it fully. Finally we consecrate our time, talents, and means as called upon by our file leaders and as prompted by the whisperings of the Spirit” (“Becoming the Pure in Heart,” Ensign, May 1978, 81). Though Jesus Christ had fulfilled the law of Moses﻿—and this law continued to be practiced at the temple in Jerusalem﻿—His followers continued to look to the Jerusalem temple as an important place of worship. References in Acts indicate that the Jewish Christians went often to the temple to pray, worship, teach, minister, and participate in religious celebrations (see Acts 3:1; 5:12, 20, 42; 21:23–31; 22:17–18). The Apostles often preached at the temple, perhaps because they knew they would find individuals interested in God there. When Paul visited Jerusalem, he too worshipped and preached at the temple. When Paul was arrested in Jerusalem in about A.D. 58, his captors took him out of the temple and shut the heavy temple doors behind him (see Acts 21:30). Just 12 years later in A.D. 70, the Jews revolted against Rome, which resulted in the destruction of the temple by Roman armies. The temple and the synagogue had long been gathering places for public Jewish worship, but the followers of Christ also began to meet for worship in the homes of Church members (see Acts 2:46; 5:42; 12:12; Romans 16:3–5; 1 Corinthians 16:19; Colossians 4:15; Philemon 1:1–2). Some have called these meeting places “house-churches.” In the book of Acts and in Paul’s letters, we learn that when these early Saints gathered together for worship, they often dined together (see Acts 2:42, 46), partook of the sacrament (see 1 Corinthians 11:26–34), prayed (see Acts 2:42), preached the gospel to one another (see Acts 20:7), and sang hymns (see Ephesians 5:19). Acts 1–2 records several instances of the Lord directing His Apostles through the ministration of the Holy Ghost. In what ways have you seen the Lord direct His modern Apostles or local Church leaders? As part of a Church calling, you may have the responsibility of suggesting names of people to receive a calling in the Church. How might Acts 1:21–24 provide a pattern for you to follow? Think about the principles and ordinances Peter mentioned in Acts 2:38. How is each one essential to receiving the full blessings of the Atonement of Christ? Compare Peter’s actions as recorded in John 18:15–27 and in Acts 1–2. What differences do you see? Write a short paper explaining what role the Holy Ghost played in Peter’s transformation. Explain how the companionship of the Holy Ghost can make a difference in your life. Search Acts 2 and list ways the Holy Ghost blessed people on the day of Pentecost.